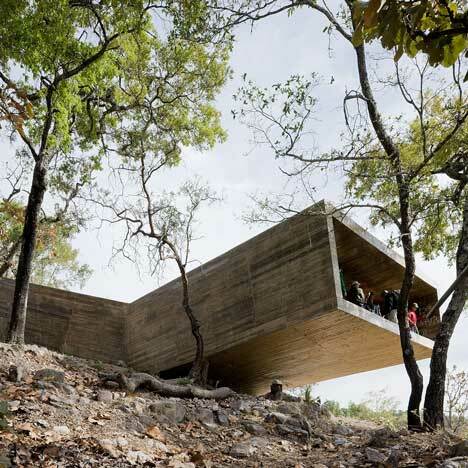 Our fourth featured pavilion from Mexican pilgrimage route La Ruta del Peregrino is a precariously balanced viewing platform by Chilean architects Elemental. The Crosses Lookout Point is at a higher altitude on the Jalisco mountains than any of the other new landmark shelters along the 117km-long route. Positioned like a seesaw at its tipping point, the concrete pavilion provides those who step inside a framed view of the landscape. Photography is by Iwan Baan. More images of this project can be found on his website. Ruta del Peregrino is a religious phenomenon centred and moved by the adoration to the virgin of talpa. La Ruta del Peregrino (Pilgrim's Route) stretches out on a distance of 117 kilometers. Approximately two million people participate each year in this religious phenomenon coming from different states of México to walk through the mountain range of Jalisco, starting in the town of Ameca, ascending to el Cerro del Obispo at an altitude of 2000 meters above sea level, crossing the peak of Espinazo del Diablo to descend to it's final destination in the town of Talpa de Allende to meet with the Virgin of Talpa as an act of devotion, faith and gratitude. This religious voyage has taken place since the 17th century, for the pilgrims the act of faith is carried to penitence, the conditions of the route are harsh. This sacrifice carried with austerity is an essential part of the promise or offering that become the ritual of purification. This project aims to provide the historical route with better conditions for the pilgrims as well as to maximize the social and economical profit for this area by taking advantage of this massive event. Based on a systematic vision the project becomes a sustainable site with different layers of meaning. As we focus on the whole, the master plan consists of an ecological corridor with infrastructure and iconic architectural pieces that add to the religious ritual and also aim to appeal to a broader audience and allow the Route to have a flow of visitor beyond the religious. The focus is on the iconic narrative given to the Route with 7 pieces that strongly relate both to the extraordinary landscape and to the religious ritual, becoming the imaginary landmarks of a deeply rutted phenomenon. Each landmark by a different designer, a group of individual dialogues with specific sites and intentions that add up, to weave a single story.